Schaumburg, IL – July 15, 2016 – INX International Ink Co. will feature a strong line-up of both new and established products at Labelexpo Americas, being held September 13-15 at the Donald E. Stephens Convention Center in Rosemont, Illinois near Chicago. 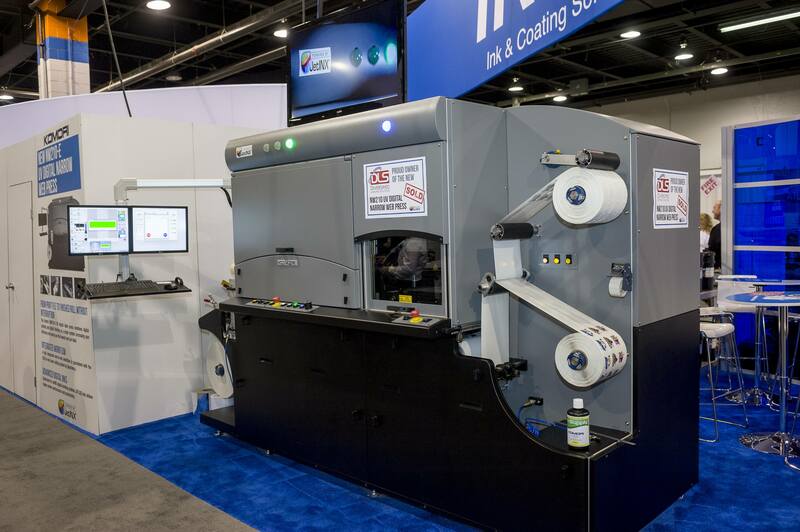 INX (booth 3010) plans to unveil the new HMJ-250 medium batch automated ink dispenser and will exhibit the NW210 inkjet UV digital narrow press and ION label inks, which have earned the trust of label printers and converters from coast-to-coast. The HMJ-250 is a medium-sized and affordable batch ink dispenser built for INX by HMJ tech. This versatile machine boasts many features including fully automated valve cleaning and single point dispensing into any container, from narrow-neck jugs to six-gallon pails. The system is designed to work with HMJ tech’s modular media farm, which can draw from a wide range of sources including kits, drums and bulk containers. The HMJ-250 can be customized for any ink room and can be configured for up to 24 stations of water-based, UV-curable or solvent-based inks. The solid-state industrial control system offers true, real-time dispensing which can produce a four-ingredient gallon of ink in only 90 seconds. Whether it is a few batches a day or back-to-back production, the HMJ delivers clean, quick and precise dispensing. The NW210 inkjet UV digital narrow web press delivers best-in-class image quality performance with UV LED advanced curing technology. It delivers single pass output on any label stock at wicked speeds of up to 80 feet per minute, combining printing and conversion to produce outstanding color printed labels at a maximum printing width of 210mm. It also incorporates a Spartanics laser die-cutting station and Xaar patented technology with multiple drop sizes and color ink channels. INX’s AquaTech ION label inks continue to perform well in the marketplace. These premium quality water-based flexographic printing ink formulations provide multiple benefits and superior press stability over a wide range of speeds. The ION-T™ Thermal series is specifically designed for printers using higher line anilox rolls of up to 1500 lines. The ION-P™ series has produced outstanding results on most prime label substrates, in addition to semi-gloss, EDP and many pressure sensitive and tag liners. For more information about these products and Labelexpo plans, visit www.inxinternational.com.